The Waitangi Tribunal was set up in 1975 to investigate Crown breaches of the Treaty of Waitangi. Its establishment allowed many issues that would once have been considered by different commissions of inquiry to be dealt with in a more co-ordinated way. 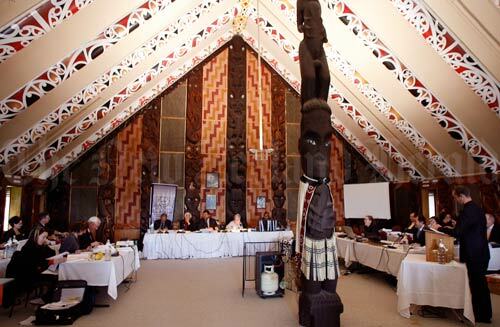 Here, members of the tribunal meet at Ōrākei marae in Auckland to hear submissions on the claim lodged by a number of iwi for guardianship of their taonga (treasures), including flora and fauna, and intellectual-property rights in relation to traditional knowledge, language and culture.